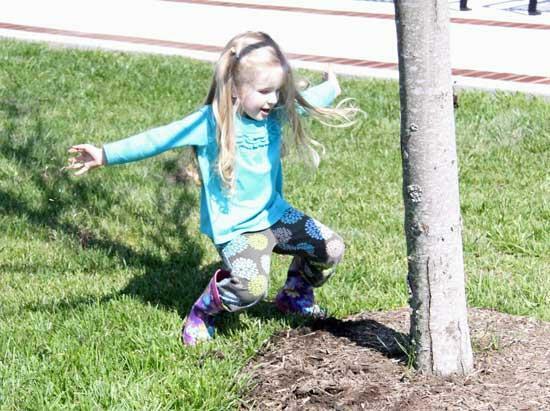 Madelyn Gannon, granddaughter of County Executive Mike Gannon, lends a helping hand as she works on the beautification of the Courthouse Square by playing in the presence of a recently planted Brandywine maple. What happened to the trees they had already planted at the courthouse? Most of them died almost immediately after they were planted. Probably due to the fact they were planted in mid-June last year, in the middle of a drought when it was 100 degrees. Does anyone know how this project was paid for? Did we have money left over from the revitalization project? Also, I am surprised by the failure of anyone to mention the use of inmates to do the work. Perhaps they are not qualified or trustworthy enough to dump garbage but planting shrubs and bushes poses no ability to hide contraband or cause any issues. Ah, the hypocrisy of it all. Corey, yes it is being paid for by unspent revitalization money. The inmates who perform work around the courthouse are supervised by a person who has received training. No such situation exists at the dump. The issue is not about the inmates at either place. Well I beg to differ because if you have someone who can supervise them at the courthouse then the same person could supervise them at the dump, unless you know of a reason why they couldn't. At the very least they could do it three days a week and help some of the older population we have who need that help taking off their garbage. Or even one day and advertise it so that group would know they could come every Tuesday and get help for example. And would it be that hard to train perhaps TWO people on how to supervise? You know my opinion on the matter, I felt it was much ado about nothing by removing them from the dump them in the first place. The person who supervises them at the courthouse already has a full time job. The people who work at the dump are also full time employees. You will have to consult with the county executive about training of dump employees regarding supervision. In the past it has been unsatisfactory, which is why inmates are no longer there. I have spoken numerous times with the county executive, the sheriff and the jail administrator about the situation, and am satisfied that under the current circumstances it is in the best interest of the county that inmates not perform duties at the dump. OK I will concede it is in the best interest for "now" by trusting you have investigated it and agree with the decision using the information you obtained. But, what is the time length of "now"? Does "now" mean forever? I am all for decisions being made with the safety of the citizens in mind when deemed necessary. So if removing them from the dump was the right thing to do then so be it. However, that does not mean we can't work toward a solution of having that process back in place. If there was a problem, then let's fix it and not just let it drag out forever because it is easier to ignore. There are a lot of elderly and disabled people who use the dump that could use some help. Does it seem to much to ask to look at alternative solutions? The impression I have is that the only acceptable alternative solution will be a change of the employees at the dump, and from what I have observed that may be something which should transpire whether inmates work there or not. I was born here, raised here and lived here all my life. You know my name; how about both of you be brave enough to stop hiding behind a pen name and share yours with me. If you don't like my opinion go read something else. I could care less if you or anyone else likes it, agrees with it or reads it. I am not sorry if it offends either one of you that I care about the elderly and the disabled who have trouble taking their garbage off because they no longer have help. I never asked the inmates to help me and I never took the help unless they got my trash before I got out of my truck to throw it in the hopper, but there are many people who did need that help and to sit back and ignore it now is inexcusable. If it was such a big deal that the inmates were at the dump, and then fix the problem by training people how to supervise and how to check for contraband when they return the jail when they are done! Apparently my comments have gone unnoticed. The problem is not, I repeat not, with the inmates with respect to working at the dump, or anywhere else. It IS with the supervision, or lack thereof, they were receiving at the dump. The sheriff has no control over who is employed at the dump. The county executive does. Exactly Kevin! The lack of supervision was the problem at the dump and has been for years. tngram at no time have I ever "bashed" our Sheriff in any way at any time. I respect Darrell very much and have no issues with the job he is doing. So quit the blatant lying when you post. If you would also re-read you would see that I said that if it was deemed necessary to remove the inmates due to lack of trained supervisors then I would concede that, but it did not have to mean FOREVER! I do help the people who are at the dump if they need it when I am there. I don't have time to be there every day because I have a job just like everyone else. I asked for alternative solutions, not sarcasm or lip from someone like you who offers no other solution than to volunteer someone else to do the job. It is not within my power to do what should be done and according to Kevin it is not within the power of the Sheriff either. Apparently that lies with Mike Gannon to solve. It can't be that hard to get a qualified and trained supervisor to watch the inmates while they perform a valuable service to the people of this county who really need it. Nor should it be hard to train people how to pat them down to look for contraband at the end of the day. Nothing I have stated has been untrue or sarcastic. Volunteering is a great solution and something I do often. The reasons for the removal of the inmates from the dump have been stated over and over. However, we keep seeing our sheriff's decision questioned over and over. Just getting old. My son is one of those inmates that worked on the landscaping.. He is not a threat to anybody out here in this county. He had some problems, yes, he did some illegal things.. yes, BUT what no one on these comments know is that he has some mental health issues...which, I might add is the #1 source of his previous behavior. So before you start to judge every single inmate that is on the work programs....check your own closets,try and have a tint bit of understanding that not all of these inmates are just hardened criminals and meth heads!! busdriver I don't judge your son. I think if he is trying to make better in his situation then I applaude him. More importantly I don't have any issues with him planting the shrubs or helping with the trash at the dump. I think it is a great benefit to the county and to him if he is allowed to do either. I too wish everyone would stop lumping these folks into the viloent offender category and understand they provide a good service to the community while trying to right a wrong in their life. And tngram I have never once question the Sheriff in any way. I have never once brought him up in any way. You are the only one who brings him into the context of the article. If you believe in the Sheriff as you imply, then I would hope you believe that he is not putting violent criminals in situations at the dump or at the courthouse doing this type of work. I know I do. Therefore it is logical to believe they should be allowed to be at both places providing a benefit to everyone. The reason for removal of the inmates is lack of trained supervision. That falls on the duty of Mike Gannon to correct, not the Sheriff and that too has been said repeatedly.